Thorne, David. The Internet Is a Playground: Irreverent Correspondences of an Evil Online Genius. New York: Jeremy P. Tarcher/Penguin, 2011. Adobe EPUB. Hello, my name is Simon. 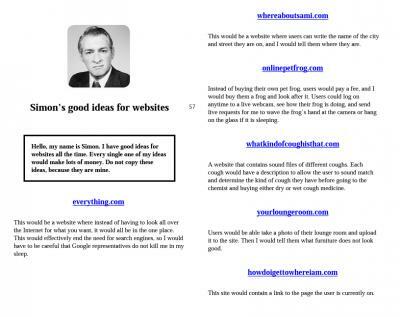 I have good ideas for websites all the time. Every single one of my ideas would make lots of money. Do not copy these ideas, beacuse they are mine.